Swami Agnivesh is a radical monk and a leader in the Arya Samaj who has devoted his life to human rights of the most oppressed and advocacy against bonded labour. He has been vocal in his advocacy against Hindu nationalism (Hindutva). This is a video he made for Sadhana recently, detailing the way he was beaten up twice recently by Hindu mobs. Swamiji is traveling for the Parliament of World Religions, and Sadhana has helped organize these events with him. We hope many of you will attend. Swami Agnivesh will be a panelist on Sadhana’s panel at the Parliament of World Religions, “The Co-Creative Dance of Dharma and Justice: The Movement of Progressive Hinduism” on Sunday November 4, 6 -7 pm, Room 605. 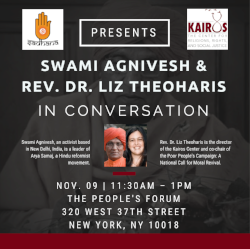 Swami Agnivesh will be in conversation with Rev. Dr. Liz Theoharis, director of the Kairos Center and co-chair of Poor People’s Campaign. This conversation is cosponsored by Sadhana, and will be filmed. Organized by NYU’s South Asia Society and cosponsored by Sadhana. 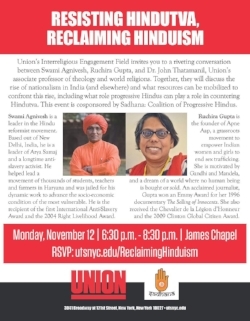 Dr. John Thatamanil, professor at Union Theological Seminary and advisory board member of Sadhana will be in conversation with both Swami Agnivesh and human rights activist Ruchira Gupta. The event is cosponsored by Sadhana.